For 100 years, Serenus Johnson Construction has been a well-respected commercial construction company that proudly services the Great Lakes Bay Region and beyond. When you hear Serenus Johnson Construction, it is a company name that proudly upholds it founder’s belief in honesty, hard work, and quality. The 1800’s and early 1900’s saw a mass emigration from Europe’s unrest and uncertainty, to a land of freedom and opportunity, the United States of America. The residents of Finland were no exception, and Serenus Johnson was among them. When he arrived in 1912, he joined his five brothers and a sister, who preceded him, working on the freighters that sailed the Great Lakes. Soon his new country was involved in World War I and Serenus took a job as a riveter in a plant that was building boats for the war effort. During that time, Serenus married and started a family that would come to include three daughters and two sons. In 1919 Serenus founded his construction company. He and his wife made a strong team, as they ran a business and raised five children. They, along with many other Americans, weathered the Great Depression to see their business grow in Bay City and throughout the surrounding communities. The material and labor shortages of World War II were difficult on the construction business. With the end of the war, there was a building boom across America, including Mid-Michigan. When his youngest son, Raymond, joined the company it became, “Serenus Johnson and Son.” The company continued to expand into different types of construction and to other communities. Serenus decided it was time to retire in 1962. Raymond continued to operate the business successfully until he retired in 1996. Tom Johnson served as President until 2014 and retired as Vice President in 2018. Bill Woolwine, Jr. has served as the President of Serenus Johnson since October 2014. The company is now Serenus Johnson Construction, a name that reflects its founder’s belief in honesty, hard work, and quality. Serenus would be pleased. At the age of 17, Serenus Johnson emigrated from Finland to the United States in 1912, following the footsteps of his sister and five brothers who preceded him to America. Soon after his arrival he joined his brothers working on the freighters that sailed the Great Lakes. In 1919, he founded his construction company, providing various general contracting services in the Bay City area. Though language was a barrier for Serenus in the beginning, his outgoing personality and ability to win friends served him well in building his business. He and his wife made a strong team, as they ran the construction business and raised five children. The depression and World War II challenged the construction industry with poor economies, lack of labor, and material shortages. Post WWII construction boom, which leads to the construction of many school and church buildings. Raymond E. Johnson, Serenus’ youngest son, takes over sole ownership January 1, 1962. Thomas A. Johnson, Raymonds youngest son, begins his full time involvement in February 1982. Raymond Johnson served as president of the Michigan Chapter AGC (Associated General Contractors) in 1987. 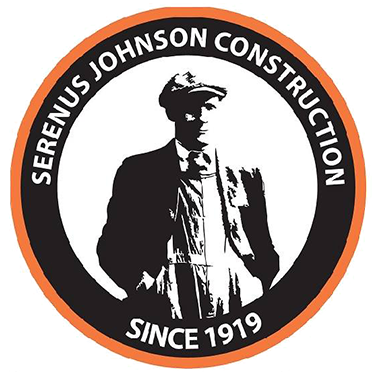 Serenus Johnson & Son Construction becomes incorporated in May of 1988 with Raymond Johnson as President and Thomas Johnson as Vice President. Raymond Johnson retires and Thomas Johnson becomes President January 1, 1996. Bill Woolwine, Jr. becomes Vice President October 1, 2001. The 90th Anniversary Celebration of Serenus Johnson was celebrated on July 16, 2009 with an open house. On October 1, 2014 Bill became President of Serenus Johnson Construction. Bill is responsible for the oversight of the company and will be working with clients on Design/Build projects. He is the primary contact for clients and plays an essential role in the objectives and growth of the company. Bill strives to meet the needs of our clients, subcontractors and employees and takes great pride in his work.